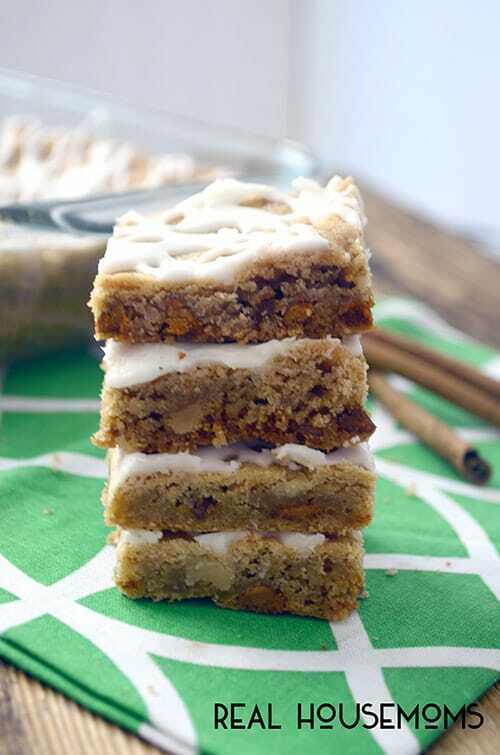 CINNAMON WALNUT BARS are an easy treat that’s perfect for fall! Loaded with nuts and your favorite baking spice flavors, no one can resist this dessert! Do you love cookies but hate all the baking time involved? Well I do so I have started making my cookies into bars. Same great flavors a lot less time in the kitchen baking! These Cinnamon Walnut Bars are no exception, these simple bars can be whipped up in very little time. These bars have another time saver to them as well. It uses a simple baking mix. I stopped by a local thrift store and came across two cooking pamphlets that use baking mix in all the recipes from chicken coating to “impossible pies.” I knew I could come up with a simple bar recipe using baking mix so I set out to create an easy and delicious bar. 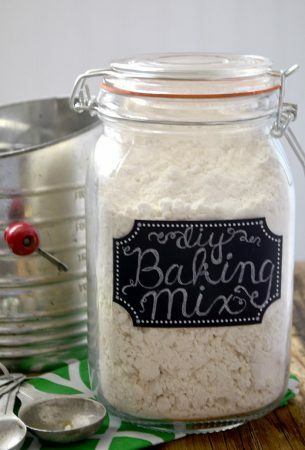 Most baking mixes already have some sort of shortening in them and to figure out the proportions I did a little digging on the internet to find a perfect homemade baking mix. Once I knew the proportions in the baking mix I could work up this little recipe. You can also use the store bought baking mix it will work the same. These bars are packed with cinnamon chips and walnuts with even more cinnamon in the dough. I like to cream my butter, sugar and eggs until they are light and fluffy. There is just something about working the butter and sugar together that makes a huge difference in cookies and bars. The glaze on top of these bars adds just a little more sweetness, plus they just look pretty. The glaze is super easy to make too. Key is to use room temperature butter in the glaze and the bars. I usually set out 2 bars of butter out the night before I bake to make things easier. 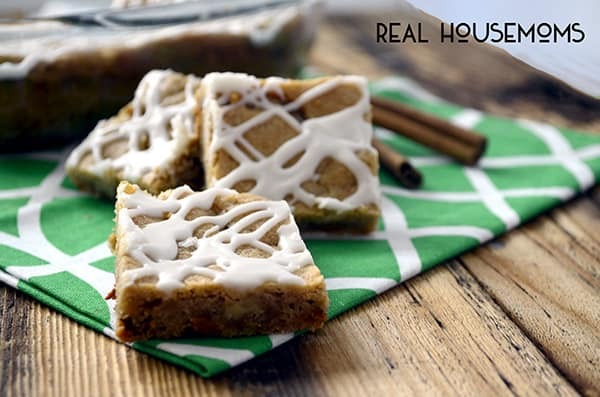 CINNAMON WALNUT BARS are an easy treat that's perfect for fall! Loaded with nuts and your favorite baking spice flavors, no one can resist this dessert! Preheat oven to 350 degrees. Grease a 9"x13" pan, set aside. Place butter and both sugars in mixing bowl of stand mixer and with the paddle attachment beat until sugars are incorporated into butter. Add in eggs and vanilla and beat until light and fluffy (about 1-2 mins). Add in cinnamon, baking soda and 1 cup of baking mix and mix until incorporated, add additional baking mix one cup at a time until mixed well. Add in cinnamon chips and walnuts mix until evenly distributed into the batter. The batter will be thick. Place batter into prepared 9"x13" pan. Use back of a spatula or your hands to press dough evenly into pan. Bake for 25 mins in preheated oven. Do not over bake. When done allow to cool completely before glazing bars. Place powdered sugar in small mixing bowl and add in soft butter. Using the back of a spoon work the butter into the powdered sugar as much as you can. Adding milk one teaspoon at a time into powdered sugar butter mixture, mix thoroughly with a spoon until desired consistency is reached. You want the glaze to be thin enough to drizzle over top of bars but not watery. If the glaze is too thin add more powdered sugar. Drizzle over completely cooled bars. Allow the glaze to set up for about an hour. Cut into squares and enjoy. If you would like to make your own baking mix you can find my recipe HERE. 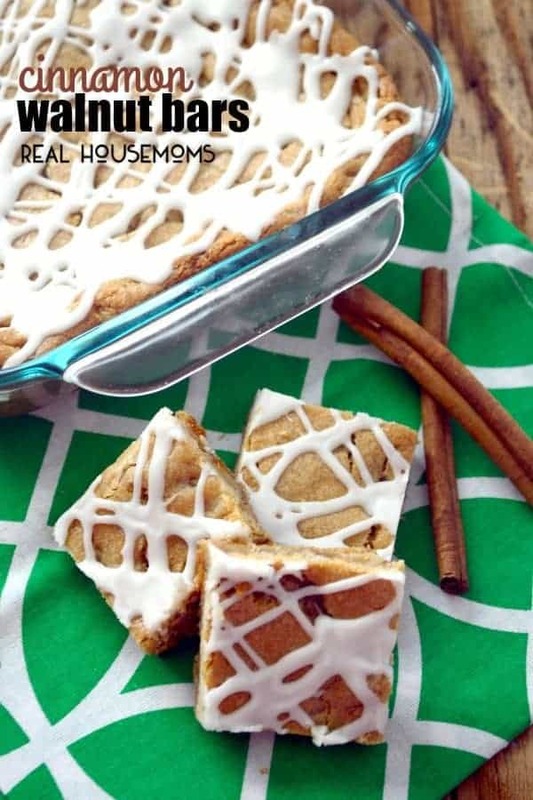 Could you make and freeze these ahead of time Also, how long are they good for after baking?